Opa! 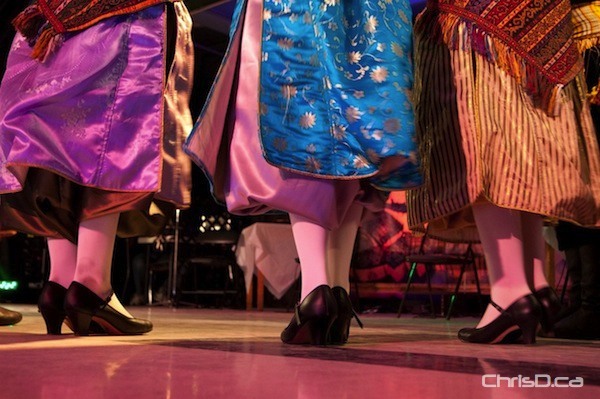 The Greek Pavilion in Folklorama’s Week 2 lineup is known for its dancers dancing in unison in a carefully choreographed performance. Throw in the hot lights and non-stop movement, and the performers are drenched to the bone by the end of it all. Did we mention they do four shows a night? They’re definitely troopers. If watching all the action on stage doesn’t draw up an appetite for you, the menu itself will make you want to venture over to the food table and sink your teeth into some delicious Greek offerings. The pork souvlaki is still the item of choice among festivalgoers, which is barbecued on site daily in front of the venue. Add a Greek salad, lemon potatoes or homemade bread and you have yourself a feast. The only drawback to this pavilion is the seating arrangement. Each row of tables are aligned quite tightly together, leaving very little room to move in and out, especially if you’re carrying a plate of food. The chairs are also squished together to save room, but the efforts to squeeze in as many people as possible creates an uncomfortable experience for the audience. Playing at the St. Demetrios Greek Orthodox Church, 2255 Grant Avenue, with nightly shows at 6:45 p.m., 8:15 p.m. and 9:45 p.m. An early Saturday show begins at 5:45 p.m. Dinner reservations are available by calling 884-8722. Folklorama runs until August 14. For a complete schedule of pavilions, visit Folklorama.ca.